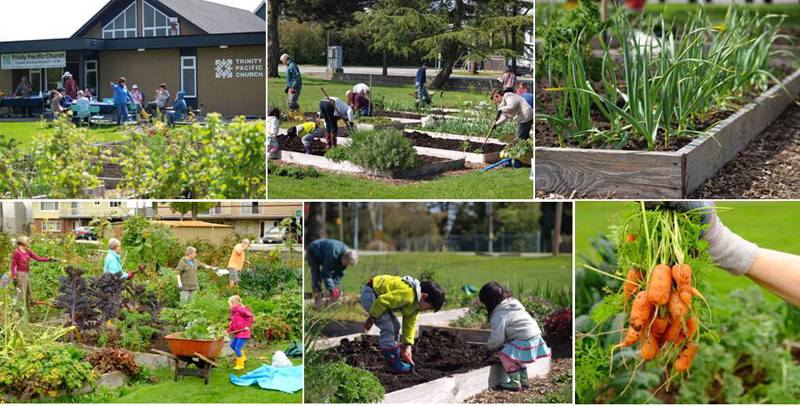 The Trinity Pacific Community Garden exists as a place for members of the congregation and the neighborhood to experience the joy of growing and cultivating a garden. We value not only the opportunity to grow delicious and nutritious fruits, vegetables and beautiful flowers, but also value the community aspect of doing this together with others! …a time to come out to the garden to connect with other gardeners, learn from one another and swap experiences and harvest! Our current gardeners have the prerogative to continue to rent their plot for another year and must notify us by the end of February of their intent to stay. Any available plots will then be assigned on a first come, first served basis. We have a short waitlist for a plot at this time. Anyone interested in being put on the waitlist is encouraged to email: Trinitypacificgarden@gmail.com. What you grow is your choice and yours to maintain and harvest. Many of us are novice gardeners and learn from one another. Learning and experimenting is part of the fun. Throughout the year we organize educational and social events to increase our knowledge and build community. These have ranged from workshops on ‘How to grow a Bee-Friendly garden’ to eating out together in various ethnic restaurants.